Info "Hit the red crystal balls with your boomerang! When there are two, you'll have to make a path that'll cross both with one toss. The Legend of Zelda: Phantom Hourglass was released for the Nintendo DS in 2007." Phantom Hourglass is one of 9-Volt's microgames in WarioWare Gold. It is based on the Nintendo DS The Legend of Zelda game of roughly the same name. 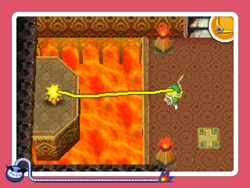 The player must have Toon Link draw a path for his Boomerang to hit one or both of the Shock Switches. 1st level difficulty: There is only one Shock Switch present, and the player must draw a straight line. 2nd level difficulty: There is only one Shock Switch present, and the player must draw a path that loops around. Rarely, there are two Shock Switches present, and the player must draw a straight line. 3rd level difficulty: There are two Shock Switches present, and the player must draw a path that loops around. This page was last edited on March 10, 2019, at 03:47.